How do we load, unload, and transport heavy cargo like gas turbines, assembled boilers, reactors, heavy vessels, bridge sections, off shore rigs, etc. weighing hundreds and thousands of tons to and from cargo carriers and barges? The simple answer could be “Use a crane." However, it is not always that simple. If cranes are available at the port or on the ship, these can lift the cargo on or off the ship very easily. This is the LOLO method (Lift On & Lift Off). This is the conventional method for handling cargo and is simple for lighter cargo. For heavy and over-dimension cargo weighing hundreds and thousands of tons, the availability of suitable cranes puts restrictions on the LOLO method. In the RORO method, the heavy cargo comes on a hydraulic platform trailer. The platform can move up or down using hydraulic cylinders. The size, capacity, and type of the trailer depends on the load, terrain, and route. The trailer drives on to the deck of the ship or barge. The hydraulic platform lifts the cargo so that support legs can be placed under the cargo. The platform lowers the cargo on to these supports, and the cargo is lashed to the barge or ship. The hydraulic platform further lowers and the trailer drives out. At the destination port the trailer drives beneath the cargo, and the platform rises and lifts the cargo of the supports. After the supports are removed, the trailer platform lowers with the cargo and the trailer drives out. If the port of shipment has a suitable crane, then only the roll off is necessary. The crane lifts the cargo on to the support legs. Good planning is required for positioning the cargo on the barge to avoid costly hiccups during the roll off operation. Only minor preparation or strengthening of road or port area is required for a RORO operation. Most of the RORO barges and ships have ram doors, which open out to form the bridge between the dock and the barge. 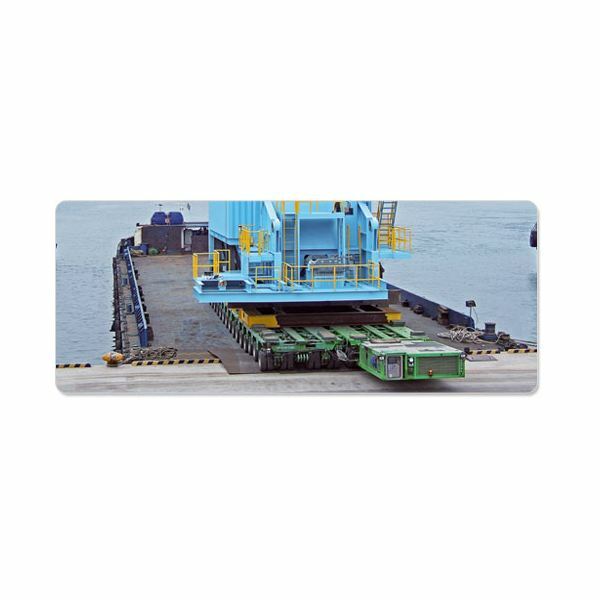 The main requirement for a RORO operation is the hydraulic platform multi-axle trailer. These trailers are available in modular forms where additions can increase the load carrying capacity. The cargo weight and size decides the type of prime mover. Electronic or hydraulic control of the individual axles of the trailer allows tight maneuvering inside the barge. Hydraulic control of the level also allows safe operation during the buoyancy of the barge. The multi axle-trailer is much easier to ship to remote locations than a heavy crane, and it requires much less time to set up and operate. The transportation loading and unloading function is done with same equipment.